The Crescent's second mini-festival of folk, acoustic and roots music. 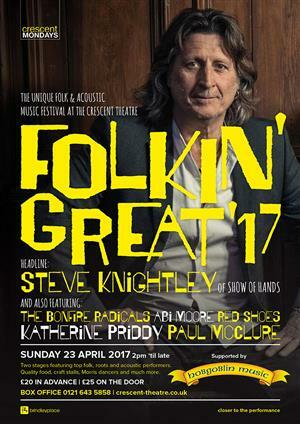 The line-up is headed by Steve Knightley, one of the very best English folk singers of his generation and a real crowd-pleaser. He is ably supported on two of our stages by a cast of internationally-acclaimed performers and local talent including The Bonfire Radicals, Red Shoes, Abi Moore, Katherine Priddy and Paul McClure. A dazzling day's music is guaranteed. Two stages featuring top folk, roots and acoustic performers. Quality food, craft stalls, Morris dancers and much more.